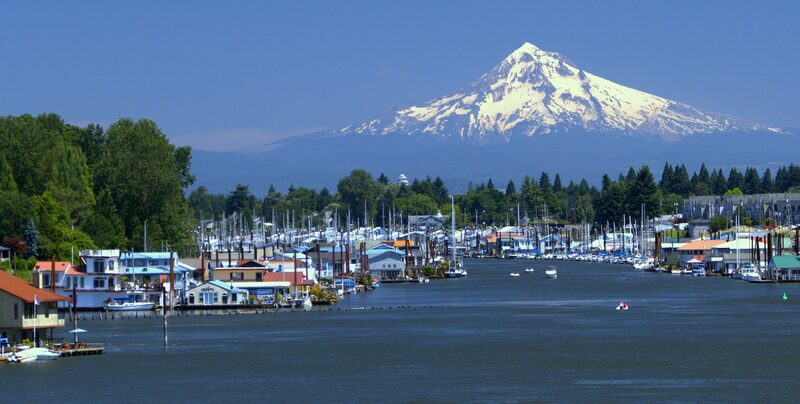 anport, Oregon’s second largest city, with a population nearing 22,000 in the mid 1940s, was located near the Portland International Raceway. 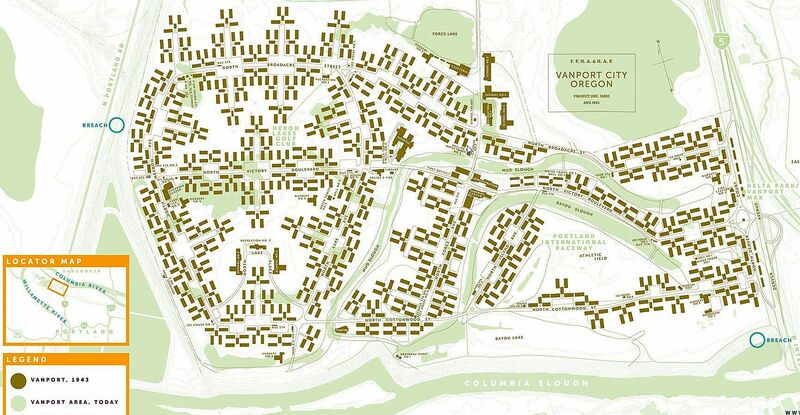 Vanport was dramatically destroyed at 4:05 p.m. on May 30, 1948, when a 200-foot (61 m) section of the dike holding back the Columbia River collapsed, killing 15 and making the entire population of 18,000 homeless. Vanport Mosaic has collected hundreds of stories of the flood and its consequences. Denver Avenue (near the current I-5) is just above the top of the photo. The break was in the lower portion of photo. The break in the dike was near the confluence of two railroad tracks, on land that is now on Heron Lakes Golf Club (map), along the North/South Railroad birm. 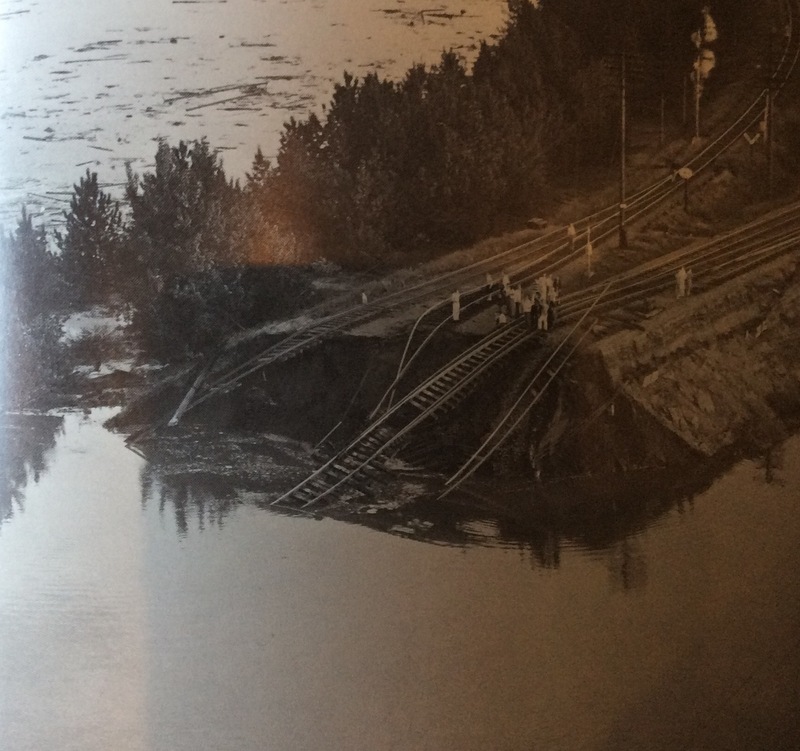 The railroad berm gave way, although officials had announced earlier that day that residents had nothing to fear. 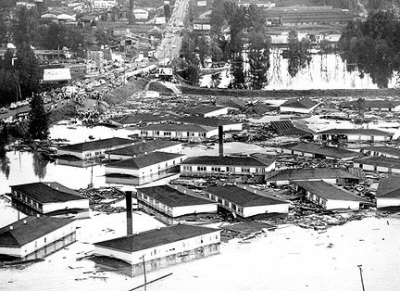 Vanport was completely overwhelmed by the Columbia’s high water in a matter of hours. Rich Rubin’s 2016 play “Cotttonwood In The Flood,” takes you inside Vanport and the May 30, 1948 Memorial Day flood. “Left Hook”, a new play by Rubin, was inspired by the history of the Knott Street Boxing Club and urban renewal projects that disrupted a once vibrant neighborhood. More than 100,000 people called the community home between 1943-1948. Vanport was also home to returning World War II veterans, returning Japanese internees and Vanport College, which became Portland State University. The Vanport Mosaic festival, in 2018, celebrates the 70th Anniversary of the Vanport Flood and the 50th anniversary of the Fair Housing Act. The annual event is held in late May. Vanport Mosaic Trailer from Vanport Mosaic. The great Jon Tuttle produced Local Color a documentary on Portland’s African American diaspora.